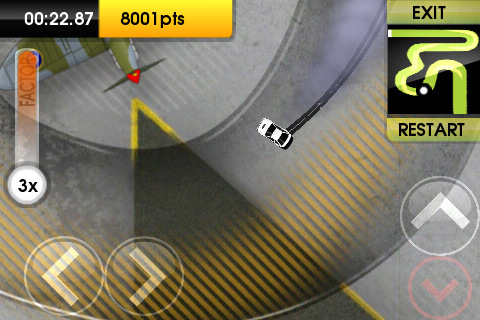 Convergent Online Media Ltd bring us Drift Legends, a very challenging yet addicting drift game for the iPod touch and iPhone. The concept of the game is very simple, drift the course and do it as neatly as possible. Doing so will award you with points and depending how well you do, you will be awarded a bronze, silver, or gold medal. There are five worlds and five levels per world, which make up a total of 25 tracks. For such a simple game, I wondered why it took the time it did to sync into my iPod touch. It wasn’t until I turned on the game that I realized it uses actual songs by artists. Not the simple 8-bit or video game music a handheld usually has but actual songs making the file size 106 MB. The music in the game varies from Rock, to Techno, and even a little Dubstep. There are four unlockable cars, but probably because of copyright issues, the cars are not named. The issue with the unlockable cars is that you can’t use them to continue. When a new car is unlocked and you want to use it, you have to start a new game. Unfortunately there is no car customization. There is a stat bar next to the car that says “upgraded level” which goes up as you progress through the game with the car. The controls are very difficult and it took me awhile to start to get the hang of the physics. The tutorial didn’t help much because it was so simple, and the first level was at a whole different difficulty. Sort of like those math teachers that give you easy examples in class but the test is a billion times harder. The controls are very sensitive. Just an accidental tap to the left or the right can cause your car to spin out. You can however change the controls to a steering wheel instead of left and right. I found this simpler at times but couldn’t perform as well when using the simple left and right buttons. Here is my overall verdict on Drift Legends. The gameplay is fun and refreshing, the cars all feel the same, and the level design is average. Overall, the $1.99 you spend is probably paying more for the music than the game. If it wasn’t for the music, the $1.99 price range could probably have been $0.99. Unfortunately there isn’t a free Drift Legends application in the App Store. 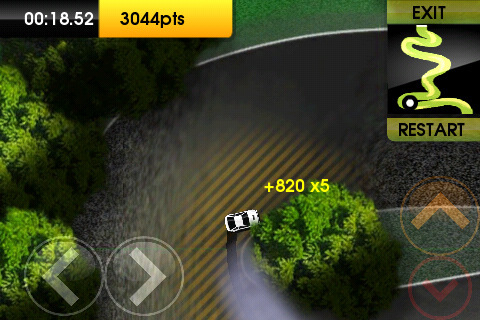 AppSafari review of Drift Legends was written by Vincent Tam on February 14th, 2011 and categorized under App Store, Games, Music, Physics Based, Racing. Page viewed 4267 times, 2 so far today. Need help on using these apps? Please read the Help Page.